The third and final instalment in Stieg Larsson’s Millennium trilogy leaves me with a mixed level of anticipation. This is not to say that The Girl Who Kicked the Hornet’s Nest is a bad novel. Hornet's Nest might not be as strong as the previous two Millennium books, but it's still far more entertaining and sophisticated than most popular fiction. It’s just that in the last screen rendition of a Larsson tale, The Girl who Played With Fire, the girl got burned. As Lisbeth clings to life in the hospital, the problem falls upon her ally Mikael Blomkvist to unravel the many layers of the Salander/Zalachenko conspiracy that led to the string of murders and the nationwide manhunt for Salander that took place in Fire. 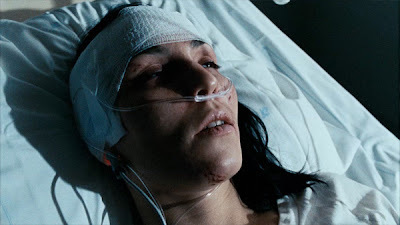 Unfortunately, for both the viewers and film-Blomkvist, the previous film handled Lisbeth’s backstory rather superficially. For example, when it comes time for Blomkvist to confront the evil Dr. Teleborian and expose his maltreatments, manipulative memos, and the all-crucial police report from Lisbeth’s youth, such plot details will be foreign to viewers who have not read the novels. True, the last film touched upon Teleborian and Lisbeth’s past, but there were explored so minutely that one probably was unlikely to register them as crucial information unless one already knew so. Conversely, the final instalment of the Millennium series might have the biggest payoff for anyone who hasn’t read the book. So little information has been revealed in the previous two films, therefore the film might actually be more intriguing and engaging for someone seeing the conspiracy come full circle for the first time. However, this could be just as debilitating: since Lisbeth’s past has mostly remained unexplored, Hornet’s Nest could potentially be information overload. The same team of filmmakers responsible for The Girl Who Played with Fire assembled The Girl who Kicked the Hornet’s Nest. While Fire was just as plot driven as its predecessor, The Girl with the Dragon Tattoo, Tattoo still unfolded with the acute attention to detail of Larsson’s novel and thus retained much of the story’s larger implications about violence against women and the inequalities/flaws of Sweden’s social system. Fire ignored most of the social aspects of the story, which is unfortunate because Larsson’s novel had a lot to say about the horrors of human trafficking. One can assume that since director Daniel Alfredson and writer Jonas Frykberg are crafting the third episode, Hornet’s Nest will also concentrate primarily on the Lisbeth-Blomkvist relationship. However, since Hornet’s Nest finally puts Lisbeth and her tormentors on trial, the relationship between the two leads unspools a strong condemnation of Sweden’s legal system. Although Alfredson et al are obligated to appease the audience, and focus on Lisbeth’s revenge and Blomkvist’s investigation, I hope they make room for some of the other characters from Larsson’s books that have yet to figure prominently in the films. This is worth mentioning because the most interesting part of The Girl who Kicked the Hornet’s Nest doesn’t really concern Lisbeth or Blomkvist. Rather, the most compelling storyline belongs to Erika. If you’ll recall, Erika decided to jump ship from Millennium in Part II of the trilogy in order to become the Editor in chief at the Svenska Morgon-Posten newspaper. Part III sees Erika actually take on the position. When she assumes office, her attempts to overhaul the failing newspaper reveal a startling portrait of the current state of the news media. The current crisis in the new industry - what with papers rapidly losing readership and revenue due to the increasing digitization of news media – has not been explored adequately in recent texts. Recent films like State of Play touched upon the matter (it was probably handled best in Season Five of “The Wire”), but through Erika’s storyline, Larsson’s novel unpacks the failings of the industry quite substantially. The sub-plot might not be lost completely, though. As always, Lisbeth finds a way in. Erika begins to receive anonymous threats and vulgar intimidation from someone in the newsroom immediately after she takes charge, and, understanding that Lisbeth is connected somehow to Blomkvist and the Wennerström affair from The Girl with the Dragon Tattoo, Erika enlists her to cypercreep the newsroom staff. Erika’s sub-plot in Part III is thus quite essential since it brings the Lisbeth-Blomkvist-Erika triangle full circle. The movies reduce Erika Berger quite substantially as a character, and it’s unfortunate because she provides a lot of tension within the relationship between Lisbeth and Blomkvist. (At the end of the first book, Lisbeth cuts off communication with Mikael when she spies him sneaking a date with Erika.). Actress Lena Endre actually gets her name in the trailer this time, so hopefully that’s a good indicator of Erika’s presence in Hornet’s Nest. Even if Erika continues to be a mere extra in the Millennium films, that is potentially forgivable because it will means that the majority of the screen time will be devoted to Lisbeth herself. After all, these films are all about “The Girl…” and it would be a shame not to see Lisbeth developed to the fullest in the final instalment. Lisbeth Salander is certainly among the best and most memorable literary characters of recent years, and in the hands of Noomi Rapace, Lisbeth’s equally, if not more, entrancing onscreen. Much of what brings Lisbeth to life in both forms is the author’s affection for the character, and it would be a fitting tribute to Larsson for the film to treat Lisbeth’s story as substantially as he did. Perhaps that’s why such a disparity exists between the qualities of the two films: the first film seemed more concerned with being a good movie, while the second aimed more to conform to the book. What is ironic is that while much of The Girl with the Dragon Tattoo was pared away in the process of bringing it to the screen, what remained was a thorough treatment of both the heroine and story. Conversely, The Girl who Played with Fire crammed in as many plot points as possible, and it omitted nearly all of the detail that made the novel the richest of the trilogy. As a result, Fire glossed over Lisbeth’s story and much was lost in translation. The Girl who Kicked the Hornet’s Nest could be the easiest of the three to bring to the screen: It has the most straightforward storytelling of the novels. More importantly, it keeps the exploration of Lisbeth Salander as its central theme, even though the action frequently deviates from her character. The Girl Who Kicked the Hornet’s Nest may be Sweden’s last word on Salander and the Millennium trilogy. The American remake is already in the works and it is scheduled for release next December. Hopefully, that last word of Hornet’s Nest will not have the feeble reply of Fire, but rather the same bold tenor that first introduced The Girl with the Dragon Tattoo. The Girl who Kicked the Hornet's Nest opens in limited release on October 29. *Dragon Tattoo and Fire play as a double bill at The Bytowne on October 27-28, so there is time to catch up!